I’ve been meaning to put this article out here for a while. These are just my personal opinions on flour and food. I make no claims to know what is really affecting so many people’s bodies. Is it gluten? Or is it too much sugar? Too much processing? Too many chemicals? Or a combination of all of these things? I don’t really know the correct answer – and honestly, I don’t think anyone really does. But, like most people, I have some thoughts on the subject. And once in a while someone asks me why I mill my own flour. People might be aware that white flour isn’t that great for us, but they wonder if there is really much difference between store bought and freshly ground whole wheat flour. And honestly, when I was first introduced to the concept of flour milling, I wasn’t sold on the idea that it was so much healthy. But it didn’t take long for me to be convinced. All I had to do was make a loaf of bread using the freshly milled flour and I was converted. The dough was softer than any dough I’d made using whole wheat flour. And the bread tasted fabulous. I think that because we don’t hear about flour milling very often that people assume it must be something that is difficult or time consuming. If you’ve been to one of my classes, you already know that it’s neither of those things. If you grind your coffee beans most mornings, then you are already exerting the same amount of effort as I do when I grind flour. So, it’s not hard. And as a mother of four who occasionally fits in a little civil engineering on the side, I honestly don’t have time for anything that adds an extra challenge. But I do make time for things that I feel make a difference to the quality of my family’s food and health – and flour is one of the easiest places I’ve found to make a difference. Plus baking your own bread is a rewarding and relaxing experience in its own right. Before wheat berries are ground into flour, they can be considered a live food. If they are exposed to moisture, they will sprout and germinate. When they are ground into flour, they immediately begin to oxidize. And just like your coffee beans, the flour will taste better when it is freshly ground. Oxidation also affects the vitamin and nutrient levels in the flour. 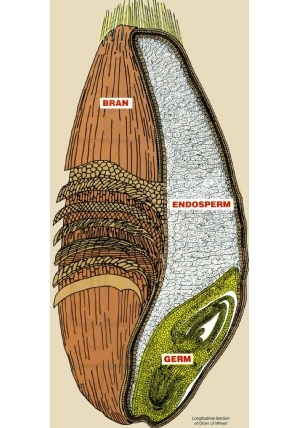 Most of the vitamins and nutrients are contained in the wheat germ. There is also Vitamin E oil in the wheat germ. Over time, the Vitamin E oil eventually will go rancid in whole wheat flours. If you have ever had whole wheat flour that tastes bitter, it is likely it’s been sitting on the shelf too long. This is one of the reasons that white flour became so popular for mass production – it has the germ removed for shelf stability, but removing the germ also removes the vitamins and nutrients from the flour. White flour also has the bran removed, which contains fiber and helps with digestion. All of this processing means that white flour barely resembles the original whole wheat flour made directly from wheat berries. Do some research on processed flour. While it can be hard to find clear, non-biased articles, try this one on WebMD as a start and then try googling processed flour. You’ll find that flour is one of the most processed foods in our grocery stores. Take one of my classes or find a local class on whole grain baking. You’ll learn something new and get lots of samples. Try this link through Bosch Kitchen Centers to locate other demonstrators who teach milling and whole grains. Bake your favorite recipe using freshly milled whole grain flour and see if you don’t love it.